The native form of this personal name is Nemes Jeles László. This article uses the Western name order. 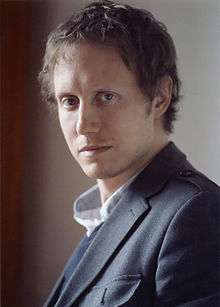 László Nemes (Hungarian: [ˈlaːsloː ˈnɛmɛʃ ˈjɛlɛʃ]; born Nemes Jeles László; 18 February 1977) is a Hungarian film director and screenwriter. His 2015 debut feature film, Son of Saul, was screened in the main competition at the 2015 Cannes Film Festival, where it won the Grand Prix. He is the first Hungarian director whose film has won a Golden Globe for Best Foreign Language Film. His film, Son of Saul, is the second Hungarian film to win the Academy Award for Best Foreign Language Film. In 2016, Nemes was a member of the main competition jury of the 2016 Cannes Film Festival. After directing his first 35-mm short film, With a Little Patience, in September 2006, he moved to New York to study film directing at New York University's Tisch School of the Arts. Beginning in September 2011, he spent five months in Paris as part of a scholarship program arranged by the Cinéfondation, where he and Clara Royer developed the script for Son of Saul. In 2012, they continued intensive work on the screenplay for seven months at the Jerusalem International Film Lab rubbing shoulders with emerging directors such as Boo Junfeng and fr:Morgan Simon. He developed his project "Sunset" through the TorinoFilmLab Script&Pitch programme in 2012 and the Framework programme in 2015. His debut feature film, Son of Saul, premiered at the 68th Cannes Film Festival as part of the main competition. It won the Grand Prix, the second-most prestigious prize of the festival. Nemes accepted the 2015 Golden Globe for Best Foreign Language Film for Son of Saul at the telecast on 10 January 2016. It is the third Hungarian film nominated for a Golden Globe and the first Hungarian film to win. Nemes has named Michelangelo Antonioni, Andrei Tarkovsky, Ingmar Bergman, Terrence Malick and Stanley Kubrick as some of his favorite directors. ↑ Henry Barnes (24 May 2015). "Cannes 2015: Jacques Audiard's Dheepan wins the Palme d'Or". The Guardian. Retrieved 24 May 2015. ↑ Origo. "Ott egy magyar a világ legjobbjai között". Origo.hu/. Retrieved 11 January 2016. ↑ "'Son of Saul' Director László Nemes on Capturing a Portrait of Hell and the Spiritual Experience of Cannes". The Film Stage. Retrieved 16 January 2016. ↑ "Festival de Cannes - From 13th to 24th May 2015". Festival-cannes.com. Retrieved 11 January 2016. ↑ "La Cinéfondation aide les cinéastes de demain". Le Monde à Cannes. Retrieved 11 January 2016. ↑ Nancy Tartaglione. "'Son Of Saul': From Cannes Grand Jury Prize To Golden Globe". Deadline. Retrieved 11 January 2016. ↑ Son of Saul wins Golden Globe for Best Foreign Language film, timesofisrael.com; accessed 22 January 2016. ↑ Origo. "Ott egy magyar a világ legjobbjai között". Origo.hu. Retrieved 11 January 2016. ↑ Nick Newman (24 May 2015). "Jacques Audiard's 'Dheepan' Wins Palme d'Or; Full List of Winners at 2015 Cannes Film Festival Unveiled". The Film Stage. Retrieved 24 May 2015. ↑ "TOUTES LES RÉCOMPENSES DU FESTIVAL DE CANNES 2015". Festival-de-cannes.parismatch.com. 23 May 2015. Retrieved 10 January 2016. Wikimedia Commons has media related to László Nemes.